If you think you are too old to get braces, think again. It is never too late to improve the appearance and function of your smile with orthodontic treatment, and thanks to options in clear braces, it has also never been easier to get the smile you want. Dr. Joshua A. Holcomb is pleased to offer Invisalign in Collierville for teens and adults alike. Keep reading to find out how it works and whether or not it is right for your smile. 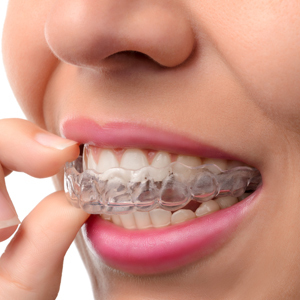 Invisalign gradually realigns your bite using a series of clear plastic aligners. Each one is designed to fit snugly around your teeth at each stage of the treatment, placing consistent pressure on different areas of the bite to gradually improve its alignment. Invisalign aligners are removable so you can continue to eat what you like and brush and floss your teeth without any special maneuvering. And, as long as you wear the aligners for the recommended 20 to 22 hours every day, you can feel free to remove them for limited special occasions -- like big meetings or presentations -- to speak with full confidence. In general, treatment with Invisalign is short. Most are completed within 6 to 18 months. The total treatment time will depend on the complexity of your case and how well you comply with the instructions. Invisalign recently implemented some changes and upgrades to make the treatment even better. The special plastic materials used are now sturdier than before, and some patients can advance to the next aligner in the series after just one week instead of two. New compliance indicators that change colors when it is time to advance to the next aligner make it easier for teens to go through treatment with Invisalign. You should be in suitable oral health before undergoing treatment with Invisalign. Booking a checkup and cleaning before beginning will help to ensure that your teeth are clean and healthy going into the treatment! To learn even more about Invisalign and to find out if it is a good option for your smile, we invite you to get in touch with your dentist in Collierville today. Contact Dr. Holcomb’s office and schedule an appointment to discuss clear braces and more!